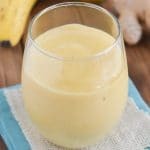 This Turmeric Smoothie is amazingly delicious and refreshing with lots of vitamin and nutrient-packed ingredients that are natural immune boosters! A perfect healthy breakfast smoothie to kick-start your mornings! Kid-friendly! An anti-inflammatory drink great for fighting colds. Vegan, dairy-free, gluten-free and Paleo! Gather, measure ingredients and place in blender. Blend for a minute or two until smooth and creamy. For additional nutrients, add some berries to this smoothie. Turmeric smoothie with almond milk; you could substitute another non-dairy milk. If the smoothie is too thick, add a bit more liquid (water or dairy-free milk). If the smoothie is too thin, add more frozen fruits or ice. Throw in some fresh or frozen spinach for added veggies. Add some honey or maple syrup if the smoothie is not sweet enough for you. Try adding a pinch of ground black pepper as it is reported to increase turmeric/curcumin's effectiveness.